Why Do People Live in Carlisle? Carlisle homes for sale in Franklin TN, also known as, Gates at Carlisle are located just west of historic, downtown Franklin off New Hwy 96 in Williamson County. This gated neighborhood is ideal for buyers looking for small yards with low-maintenance. The Cottage Homes appeal to those who are looking to downsize and simplify their life. 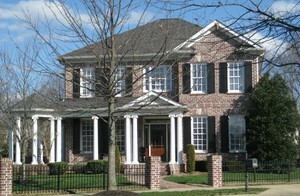 It is one of the few gated neighborhoods in Franklin TN. What's the Carlisle Neighborhood Like? There are approximately 100 homes in the Carlisle neighborhood of Franklin TN. They generally range between 2,800 to 4,500 square feet. The homes were built between 2002 to 2010 by various custom builders. The homes are reminiscent of early 1900's architecture street-lined sidewalks, picket fences, and manicured hedges. They have a minimum two-car garage with some custom lots having detached garages. One of the attractive features of this neighborhood are the courtyard homes which have a small front yard and a courtyard. The monthly HOA fee includes the landscaping and lawn care of these homes. However, the larger homes have up to a third-acre lots. There are several areas of green space including the central area with a gazebo and a two-acre lake. What Type of Activities are Offered Near Carlisle? Carlisle is just minutes to historic, downtown Franklin where you will find lots of shopping, eateries and entertainment venues, including the Franklin Theatre which offers movies, live theatrical performances and music groups. It also has close proximity to the village of Leiper's Fork where you will find quaint galleries and shops. 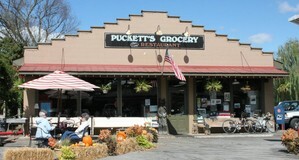 Leipers Fork is home to the well-known Puckett's Grocery. This grocery includes a restaurant and live music is performed in the evenings. You might even run into Vince Gill or one of the Judds as this is a favorite of theirs. Visitors come from miles around just to eat at Puckett's. What Schools will Carlisle Students Attend? While Franklin Special School Dist is a highly-desirable school system due to it's low student to teacher ratio, buyers should know there is an additional tax assessment to homes zoned in FSSD. Let Me Help You Find Your Carlisle Home. Call Tammie White today at (615) 495-0752!